Why not visit the Surrey Hills Area of Outstanding Natural Beauty yourself. There is so much to see and do and we have put together a variety of suggestions of what you can do in a day. The days out have been focussed on the key market towns within the Surrey Hills; Farnham, Haslemere, Godalming, Guildford, Dorking, Reigate and East Surrey areas. For other suggestions on Days out in Surrey take a look at the Visit Surrey website or the DeVere Venues website. Farnham is a vibrant and lively old English market town, with narrow streets lined with some of the finest Georgian architecture in the south of England. It is a happy blend of old and new, with a parish church and castle dating back to the 12th century. The North Downs Way National Trail starts here and there are numerous other walking and cycling opportunities. Dorking nestles at the heart of the Surrey Hills Area of Outstanding Natural Beauty. It is a delightful market town steeped in history, yet offers excellent shopping facilities and a wide selection of restaurants, cafes and bars. The town of Godalming is situated in some of the finest countryside in southern England. Narrow attractive streets, lined with many ancient and historic buildings, lie alongside the River Wey. Godalming is a town with many famous sons and daughters, for example, artist gardener and craftswoman, Gertrude Jekyll, and in 1881 became the first town in the world to have public electricity. Guildford, with its cobbled High Street, has all the charm of a country town. Tucked into a gap where the River Wey cuts through the North Downs, you’ll never lose sight of the rolling Surrey Hills. 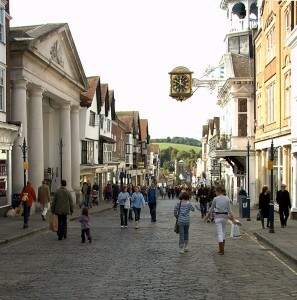 Guildford offers visitors first-class entertainment, excellent restaurants and some of the finest shopping in the South East, as well as a traditional weekly street market and monthly farmers’ market. Once described as the `fashionable capital of the beautiful Surrey Highlands’, Haslemere is an attractive market town perched where three counties meet (Surrey, Sussex and Hampshire). It is a gateway to some magnificent Surrey Hills countryside, which has helped to inspire many great artists and authors. Add this to the quirky cafés, country pubs and specialist shops and you’ve got something of the flavour of the place. Glorious countryside, vibrant town centre, a fine collection of pubs and restaurants and a variety of attractions; this is Reigate in the 21st Century. Reigate is a market town with a long and colourful history and a perfect balance of modern culture. We hope you enjoy your day out in the Surrey Hills, help us to protect this Area of Outstanding Natural Beauty (AONB) by donating to our Surrey Hills Trust Fund.